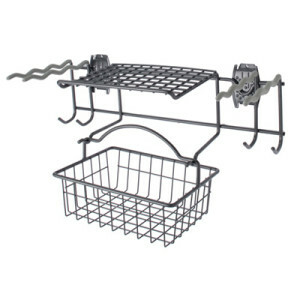 The Schulte Garden Rack and Basket is made of granite gray steel and features extra hooks for small tools and a removable basket. Carry your tools, seeds & gloves with you – or use to gather your garden produce! Fits on standard 3″ on center slatwall, or The Wall Grid. 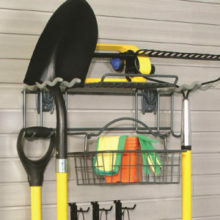 Secure Rack to wall panel with 2 Activity-LOKS (sold separately). Can be wall mounted as the brackets are spaced 16″ apart. Will not fit slatwall panels that have metal inserts. Schulte Accessories are now known as Organized Living Activity Organizers. AMEX CARD? CHECKOUT WITH PAYPAL.